Saturday night marked many things. 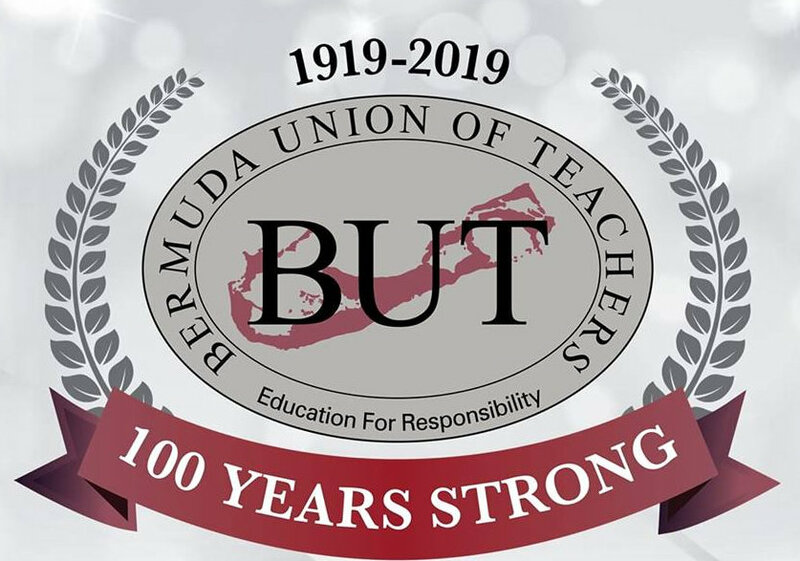 Children were born, elders passed, big life moments were celebrated around the globe … but perhaps the most significant mark on Bermuda’s collective history was being made by the Bermuda Union of Teachers’ Executive at the Fairmont Southampton on Saturday night. You see Saturday was the first day of the BUT’s second century of existence, and the BUT Executive decided that this once in a lifetime occasion should be spent reflecting, acknowledging, and thanking the men and women who made the first century of the BUT’s existence such an unadulterated success. The setting was simply exquisite, with as many sparkling things to look at as one would expect at a Centenary Gala. There were big shiny smiles, long shiny dresses, and smart shiny suits wherever you looked, and those were just the people. Even the walls sparkled on Saturday night though. From the red carpeted and white silk draped entry tunnel, to the photo station, to the dazzling sparkle wall and projected BUT logos, the Poinciana Room at the Fairmont was simply oozing elegance for this event. The guest list didn’t flatter to deceive either, with Government Ministers, former BUT Presidents, school Principals, sister Union Executives, and various other local luminaries mingling with rank and file BUT members; this was a Gala well worthy of celebrating one hundred years of a people’s struggle. Highly entertaining at best, thoroughly enjoyable at worst, this was a decidedly memorable evening, offering a program of local entertainment, prize giving, and plenty of pomp for the sizeable audience to consume. The Noire Theatre Company delivered a brilliant dramatic performance, which was ignited by a stirring rendition of the Yolanda Adams standard “Still I Rise” by the audaciously talented Shardae Lee. The performance then transitioned into a captivating spoken word piece; a telling of several of the Union’s highlights over its first century of existence. The group deserves a special mention as it is comprised of about a dozen CedarBridge Academy students, which made Saturday night’s performance that much more special. The group, of course, benefits from the amazing direction of the inimitable Sister Patricia Nesbitt, who is a proud card carrying member of the BUT, and had delivered her own spoken word tribute to the Union minutes earlier. The tributes poured in all through the evening, with the deceased past BUT Presidents getting their due next. A moment of silence was observed while the names of the late past Presidents were displayed on the large screens that adorned the front corners of the ample ballroom. These great Union servants included Reverend Richard Tobitt, Mr. Gerard Bean, Ms. Aurelia Burch, Mrs. Rosalyn Burchall, Mr. Ivan Cunningham, C. A. Isaac-Henry, Dr. Clifford Maxwell, Dr. Kenneth E. Robinson, Mr. Arnold Simmons, Mr. Russell Smith, Mr. Charles Snaith, Messrs. R. G. Stovell, Mr. Austin Thomas, Mr. McNeil Warner, and Mr. Winton Williams. The moment of silence was briskly followed by tributes to each past BUT President who is still with us. Mrs. Elizabeth Mussun Kawaley was honored with the Diamond Crown, acknowledging her as the BUT’s longest living former President. Mrs. Kawaley was present on Saturday night, and was duly showered with adoration for her significant contribution to the continuing legacy of the BUT. From that point all the living former Presidents, and a few former Organizers and General Secretaries, were honored. Most honorees were present to accept their recognition and deliver brief speeches, and all were afforded the opportunity to record video messages which were displayed on the big screens prior to the awards being issued to each of them. All the honorees who spoke delivered passionate words, exhibiting the kind of love for the people and the teaching profession that kindled the blaze that became the BUT over one hundred years ago. Reverend Dr. Erkine Simmons and Dr. Eva Hodgson offered strong words of encouragement, while Dr. Joseph Christopher highlighted a concern that we are now “Re-segregating ourselves based on wealth.” It was a sobering and though provoking commentary that spoke to the need to improve our public school system in Bermuda, a struggle the BUT has always engaged in head on. Brother Clevelyn Critchlow reminded us that “Change is constant,” and encouraged us to “Keep on keeping on.” Sister Ellen-Kate Horton and Brother Dale Butler delivered brief anecdotal gems, with former Minister Butler evoking the biggest laugh of the night from the smile-laden audience. Brother Milton Scott and Sister Joann Adams, who formed a dream team as BUT Organizer/General Secretary and President respectively from 1990 to 1993, both delivered brief, but passionate statements. Current BUT Vice President and President from 1999 to 2005, Brother Anthony Wolffe exuded pride when accepting his award. Sister Lisa Trott and immediate Past President Sister Keisha Douglas rounded out the Past President Honorees with brief discourses that revealed a distinct fervor for teaching, organizing, and leading the great Union this soiree was all about. By now dinner was done, and all that was left was to bestow the biggest honor of the Centenary weekend to the man, the face, the voice, and the fire that has been synonymous with the Bermuda Union of Teachers for over a quarter of those one hundred years: the indefatigable Brother Michael Charles. Dr. Charles was presented the inaugural Diamond Legend Award, and received it with characteristic humility and grace. He was serenaded with applause by the audience, who honored him with a full standing ovation. This was not the first standing ovation of the evening by any measure, but this standing O made it emphatically clear that no one in attendance thought that Dr. Charles was not the absolute correct candidate to receive this high honor. It was as natural as sunrise to see him holding the special prize, and just as beautiful. Ultimately, this was a simply inspiring evening. A well conceived, well constructed, and well executed observation of a timeless milestone. Many of the award recipients called for another century of the BUT. I’d think that many more centuries are in order; indeed, as long as there’s an education system, there will be a need to keep the flame that was sparked in St. John’s graveyard over a century ago burning strong. The ceremonial portion of the evening was brought to a close by BUT Treasurer and Centenary Chair Sister Nishanti Bailey sometime around 10.30pm. From then the excellent Wall Street Band played for the audience to dance the night away. Later DJ Juggling Jason took over for the dancing revelers, and no one left the Poinciana Ballroom in a bad mood on Saturday night.